Step 1. Use Supertac to glue three popsticks together to form a triangle (or create a square from four popsticks). Step 2. Glue a loop of jute string to one point as a hanger. Step 3. Glue a star sequin to the point where the jute string loop has been attached. Step 4. 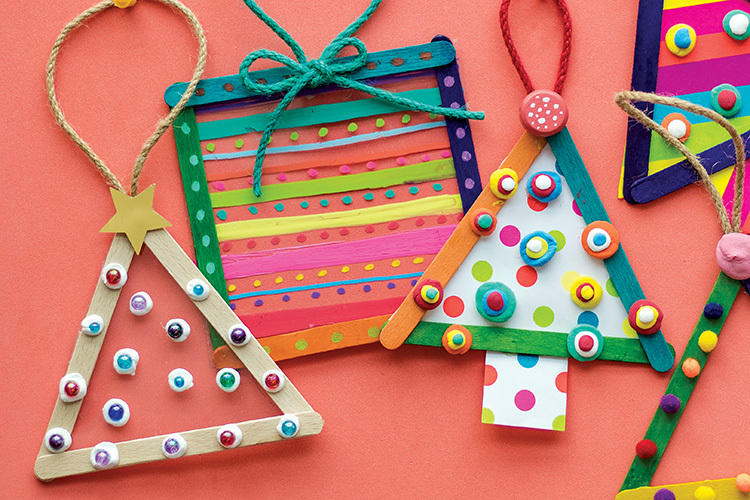 Decorate the triangle tree shape with a range of materials such as Magiclay, Posca markers, pom poms, beads, sequins and jute string bows. Extension: After step 1, glue a sheet of acetate, or Neon Pad Paper behind the popstick shape. Glue the jute string hanger to the back of the shape. Continue to decorate.